As the float can be set to any position, the position can be changed locally. 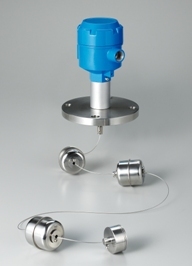 It can also measure highly viscous liquid as it strongly resists against adhesion to the probe.One switch can measure multiple points (a maximum of 6 points). Reduces the use of packaging materials and their costs, since there is no need for a wooden crate or box to transport it. Unless materials that exceed the weight of the float are stuck to it, the float operation is not affected. As the float can be set to any position using a screwdriver, the position can be changed locally. If has a self-latching function and a balance weight is attached to the lower end of the wire. Therefore, the switch is almost unaffected by liquid conditions. No need wooden crate needed, even with a length of 2m or longer, so it contributes to decreased packaging and processing costs.